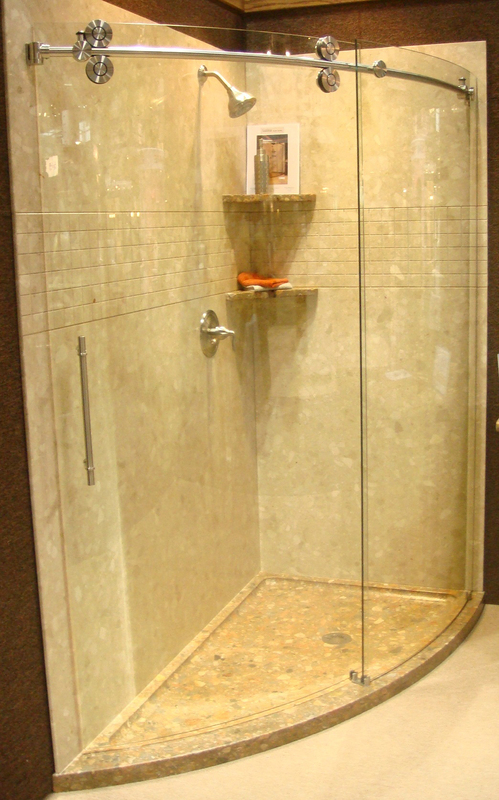 SOLID STONE Slice Shower - Also Available in: Shower Walls - Shelves - Shower Floors - Vanity Tops. All Portofino Collection colors are available in 1.2cm, 2cm and 3cm thicknesses. Slab size 48" x 120". All colors available in 12" x 12" tiles. Maximum floor size 48" x 60". All Legacy Collection colors are available in 1.2cm, 2cm and 3cm thicknesses. Slab size 55" x 120". All colors available in 12" x 12" tiles. Maximum floor size 55" x 60". Engineered marble is a stunning and cost-effective alternative to natural marble slabs and tiles. Engineered marble from Salita Showers is made from select marble aggregate (95%) and filler in a special polyester thermal set resin binder. Our engineered marble is available in a wide range of colors, popular in both residential and commercial environments. As most designers, architects and residential consumers have come to know, natural marble is a beautiful and desirable product, yet its inherent instability and color variation make it difficult to incorporate into any project. Engineered marble bridges the gap between nature and technology by maintaining the look and feel of marble while eliminating many issues typically found with natural stone. Engineered marble offers the residential consumer an affordable alternative to natural stone, while maintaining a greater level of color consistency and strength. Engineered marble makes it easy to match countertop slab material with floor tiles and mosaics offering uniformity to the finished space while providing the level of beauty and aesthetics only found in natural stone. Engineered marble is one of the most functional and practical building materials available in today’s market. The natural marble is mixed with thermoset polyester resin in a high-pressure environment. The resulting precast material is ideally suited to interior commercial environments such as flooring, wall cladding, transaction tops, bathroom dividers, vanity tops and even stair treads and risers. In slab form, engineered marble delivers all the esthetics of natural stone while the polymer matrix allows the slab to be shipped, fabricated and installed in ways never before possible with certain delicate natural marble slabs. This combination of beauty and durability makes engineered marble a perfect choice for multiple unit fabrication of vanity tops and furniture in a variety of areas, including the hospitality and healthcare markets.